Under Pressure Irrigation can help enhance your property's value and your pride of ownership by creating visual excitement at night with professional lighting techniques. We'll create drama in your yard year-round by highlighting artful gardens, dramatic trees, enchanting water features and more. Landscape lighting can be used in the same way that you would use indoor lighting to emphasize the beauty of a painting on a wall. Strategically placed landscape lighting can call attention to the best features of your yard. Under Pressure Irrigation can help make your yard as beautiful as the inside of your home! Professionally installed landscape lighting increases safety by reducing the risk of harm around walkways, decks, pools, and other landscape features. 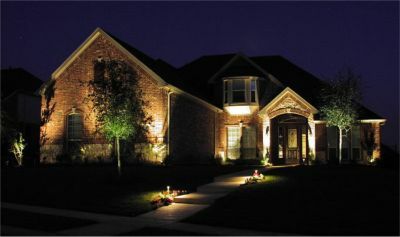 Nighttime lighting also provides greater home security by deterring burglary, vandalism and other crimes. Accent lighting can help add a sense of space and drama to your landscape. It allows for accenting or downplaying areas of your landscape, including tree lighting. Under Pressure Irrigation can soften or enrich areas of your property to enhance the evening visual aspect. Inground lighting provides a low profile light source, creating a dramatic effect that brings the subject alive. We also design and install walkway lighting, step and deck lighting, underwater lighting, spot lighting, spread lighting, shadowing, moon lighting, security lighting and more. Many new homes now have outdoor living spaces - landscape lighting can significantly increase the beauty of your yard, transforming it from "outside" to an extension of your home - an outdoor living area! Landscape lighting lets you stay outside and enjoy your yard even late in the evening.